The Week 12 roster update for NBA Live 16 has come through, featuring all of the deals from the 2016 trade deadline. Jersey numbers and the accessories for 33 players have also been updated in the latest roster. For a complete breakdown, check out this spreadsheet. Slam Dunk Contest participants Aaron Gordon, Zach LaVine, and Will Barton have also received boosts to their dunking ratings. Runner-up Gordon and winner LaVine are now sitting at 99, while Barton’s dunk rating is now 90. Additionally, all three players have been given enhanced dunk packages. Speaking of dunks, as we discussed in Episode #147 of the NLSC Podcast, there has been an issue with this year’s rookie crop not being able to dunk in NBA Live 16. The latest roster includes fixes for some of those players (including Karl-Anthony Towns, Kristaps Porzingas, and Bobby Portis), ensuring that players with dunk ratings of 60 or higher will be able to dunk in appropriate situations. 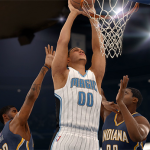 Any thoughts on the latest NBA Live 16 rosters? Feel free to post them in the comments section below, as well as in this thread in the Forum. While you’re in the mood for posting feedback, don’t forget that we’re also compiling our NBA Live 17 Wishlist, so be sure to get your suggestions in ASAP! All EA Sports games on the current share the same tech, the EA Ignite engine. Live’s needs more polish at this juncture, especially in terms of animations.